It took me about 6+ hours to earn that medal. Nothing beats the feeling of running towards the finishing line and finally crossing it. At that instant, whatever pain you’ve been feeling disappears for those few seconds as you savour sweet satisfaction. Was I happy with my run? Well considering that I didn’t train enough, it was a blessing that I managed to finish the marathon. Too bad I fell sick a week before and had exams that ended only 2 days before the race. How does it feel to complete a second marathon? Trust me, it’s totally different from the first time. Honestly, it doesn’t really help that you’ve ran one before because the pain and anguish you felt the first time round – that memory never leaves your mind. You tend to be fearful of going through the same thing again. No one likes pain, I know I don’t. But I still signed up for the full marathon this year. I don’t know why actually. Perhaps it was meant to be. Let’s just say this marathon taught me alot of things. For instance, that pain is relative. Pain. I know that the pain I felt during the marathon is probably nothing compared to the kind of pain that some other people have. My pain can be healed with a good massage (my sis gave me a really good foot massage. what a dear! ), some Deep Heat cream and lots of rest but the pain that exists elsewhere where pain and suffering is common, man, that’s a kind of pain that’s hard to heal and sometimes it goes beyond the physical. When you think about it, it really makes sense. Who am I to complain about my knees, my feet and my legs. Pain. It’s so subjective I tell you. What is pain anyway? Is it something that can be felt, heard, touched, smelt? Hmmm well I know my pain served me well. Sounds stupid but hey at least it taught me to appreciate the times when I’m not in pain! haha. Oh the things a marathon does to you. I think alot and I did plenty of thinking during the marathon and one of the things I learnt, is that it’s really not about me with my Asics DX trainers pounding on the tarmac or the smelly sweat that stinks so much and the racing heart that gives you an adrenaline rush. I really couldn’t care if people ran faster or slower than me or that I might not be able to finish the race in a timing that’s worth boasting about. In fact, throughout the entire race, I think I wasn’t running alone. Okay, I really wasn’t running alone – dear JF ran the entire leg with me (oh the sweet boy, he’s a much faster runner than me but he didn’t want to leave me behind 🙂 Aside from him, I believe God was with me throughout. I don’t think I could have completed the race without His grace. Trust me, I was revelling in my pain and thinking of the long ardous road ahead when I suddenly just shut all other thoughts and started praying. I prayed for strength, I prayed for courage to carry on and not worry so much about the many more kilometres ahead of me. That’s when I started to distract myself from the pain I felt and take it out of my mind. If Jesus could take the crucifixion and suffer for us, then what’s 42.195km? From then, I offered up the rest of the race to God and just prayed that I will be strong enough to finish it. And you know what, I did finish it earlier than expected. I thought I was going to take 8 hours! Imagine that! God is good! Ah, I’m so relieved the marathon is over I tell you. It rained halfway and it really wasn’t nice running in the rain. Heh but anyway the worst is over and I know I know, the next question is, would I run it again next year? I don’t know actually! Ask me again next year. I know this post hasn’t really been about food but hey, I thought that it’ll be nice to share something thoughtful. In case you’re wondering what’s the first thing I consumed after the race (well aside from the 100-plus, powergel, water and banana during the race), well it’s sushi! It’s good to eat lots of carbs after a marathon because your body needs it to recharge. Dad cooked a yummy dinner and gosh even after that, I still ate the sardine murtabak Mum bought. Well I didn’t eat all of it, if that’s what you’re thinkng 🙂 I’m not a glutton! Now that the marathon is over, my exams have finished, what am I to do? Bake of course! Some of you have been asking if I’m having a bakesale this Dec. Actually I’m not sure if I have the time because I’ll be taking a part time job for a while. I’ll see how ya. Will definitely update all of you. Gotta go. Will post often, now that my holidays have officially started. Ha! Take care ya’ll. Congrats on finishing the marathon! That’s a huge achievement in itself, no matter how long you took to do it! I did my first half-marathon in a time better than expected (frankly I didn’t even think I could have run it all the way) and am now very inspired to run more! Seriously, after awhile it’s all about mental strength. I’m glad you stayed strong! Congratulations on completing the full run! did ten and am feeling the pain. yours would be beyond man. Cheryl…nice seeing you there! This yr i had the privilege to be part of the volunteer team and offering drinks to those runners.Pretty fun and an eye-opener as you see how different individual run their race! Great job gal! ^^ Perhaps next yr we can go together ar..if i am not volunteering. Enjoy yr hols! Congrats on finishing the marathon and your exams!!! Hope you celebrate massively! Heya, are you gonna be on BlogTV tmr night? Was it you whom I saw? Cos I’m sure I thought I saw someone that looks really like you, and its about food blogging LOL. congrads for completing the marathon! both my MALE bosses came in limping, after half of what you ran! dimsumdolly: thanks girl 🙂 congrats to you on your first half marathon! yes it’s really all in the mind. The immense power of the human brain is astounding! exoticbeads: thanks thanks, haha is it the first time you did ten? Congrats! Rest well ya.. Lavender Cupcaker: hey linda, good to see you too. yep join next year la! Precious Moments: thank you… you attempted it too? Nvm, join next year again? hinata: heya sam, thanks! yes, am celebrating by indulging in loads of good food. Anon: You are sharp! Okay, since you already saw me, i can’t keep it a secret. Yep, it’s me. gosh it’s gonna be so weird watching myself on tv. don’t laugh okay? Hey congrats! Two Marathons! You are superb!!! After running my first half-marathon on Sunday, then i realise what it means by running and completing LONG distance. It took me great effort to complete my half-marathon. To one point, it’s all in the mind and I had to constantly push myself to keep going. I wonder if I will go for it again next year oredi. Heez. 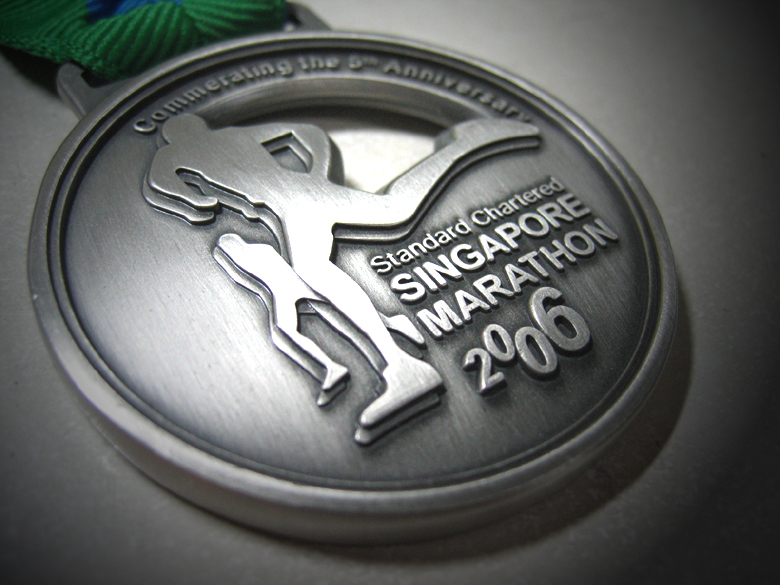 I really salute you for complete the entire marathon, twice somemore. Amazing! Anyway, even though this is my first time leaving a post in your site, I have actually been conscientiously following your blog. Heez. Enjoy reading your posts.. Keep them coming ya? Forgot to congratulate you on finishing the marathon. I was supposed to do it 2 years back but was too lazy. Why do you compete when you are in such poor condition? 6 hours is really a long time. I would be embarrassed. I am training for Stockholm Marathon 2007 June, and I have an average NOW around 4min17sec/kilometer, I want to reach 4min/kilometer before even applying. But hey that is me…..
Riet: wow, running at least half a marathon+ every week is already a feat! yes baking and running – i think it goes well together too. love your blog, but i wish i could understand your language! SwedishYlva: I ran the race knowing that my timing would probably not be as good as those who trained hard. Haha, yes you’re right. 6 hours is LOoooong. I run, but not competitively so it really doesn’t matter to me 🙂 I run to keep fit and for leisure. But you sound like a very promising runner. Good luck for your Stockholm Marathon…I wish you all the best.